How Much Does Your Party Really Cost? 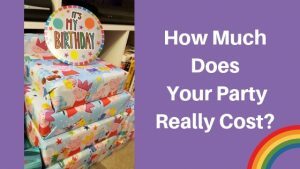 When it comes to planning your child’s party, the most important thing we all worry about is our budget and if we can really afford to hold a party for them or keep it small and simple. My youngest turned 6 at the weekend and despite being in the industry, it was the first time we had ever thrown one of our children a proper party! I thought this would be a great opportunity to see what my customers go through, and find out exactly how much a party really costs and I wanted to share this with you. Of course, every one has different budgets and ideas, so this is just based on what we could afford, but you may be surprised at my findings! Hall hire – I refuse to pay an extortionate amount of money for a venue when there are so many decent and cheap ones in Havering. We booked Ascension Church hall which was only £60 for 4 hours, one of the cheapest in our area. Cheap doesn’t always mean rubbish, we had access to a decent sized hall plus kitchen and parking. Children’s entertainer – so yes, despite being an entertainer myself, my son has seen my show so many times that it just wasn’t special for him any more. So I hired my colleague, Magic Frostie to do half of the party which included a one hour magic show and he was the icing on the cake! A decent and good children’s entertainer in our area costs anything from £200 onwards for a full two hour party. pay for anything else to keep the kids entertained. Balloons – decor isn’t the most important thing at a party but it does help to create an atmosphere and looks awesome in your photos! All we purchased was a balloon arch by Candy Magic Balloons and some table balloons where the children sat. Table balloons from Card Factory. Cake – there is nothing wrong with a supermarket cake which we have done in previous years but because we wanted something to fit in with our Doctor Who theme, I called upon Just Jules Handmade who provided this awesome chocolate cake! It truly had the WOW factor and our little man loved it! Party bags – we personally don’t like receiving the standard party bag with all the rubbish toys in that get thrown in the bin! So we wanted to give our guests something unique and special to keep. We found Doctor Who themed party bags in the sale during the summer holidays which was unexpected, and I order rocket and stars crayons from Funky Scribblers. We then printed off themed colouring sheets with our son’s name on, rolled them up and added a chocolate bar to the bag, job done! Invitations – my advice when it comes to party invites would be pick a theme that is relevant to today! Our son is a huge Doctor Who fan but with it being off our screens for two years and the new series not out for another month, there are no party resources for this theme! So we paid a visit to That Thing You Pluck who created our themed invites which included a Doctor Who picture that our son drew to personalise the front and voila, we had our themed invites! However, you can get really cheap invites, print them off at home or just create a Facebook event page to invite everyone to, free of charge. Although the quality and value of ordering and purchasing and the ease of getting someone else to create our invites was amazing, it was an expense that was probably unnecessary and you can easily do it cheaper than us! Food – I am a lazy cook, and really didn’t want to make sandwiches, or add to our stress off chopping fruit etc! So the easiest solution for us was to order pizza from the takeaway right next door to our venue! Allergies were all catered for and it went down a storm, so much so that I don’t think we ordered enough! Total cost – £50 for 6 large pizzas and a small cheese free pizza. Ouch, that does sound a lot! I didn’t really notice the costs because I started paying off for things 7 months in advance which means deposits were put down, and I could pay off for thing in instalments without having to worry about rushing around and stressing over costs. The beauty of doing things in advance means that I wasn’t just purchasing anything, I had time to think about what I could afford and how I could budget the things we really wanted like the cake and balloons. I understand that our cost are not going to be affordable for everyone. I don’t even think we could afford a party like this if you had told me how much it cost. But to see our son’s face and all his school friends, made it totally worth it. I was going to write a blog about how I would never do it again, but I left the party feeling emotional, and happy that what I thought would be stressful and a disaster, went better than I expected and it is a memory we will never forget. Plus, our son said at the end, ‘this is the best party ever,’ and I couldn’t help but think that I had better start booking it all in again for next year!